George Glaister was born in Blackpool, Lancashire on 6 September 1890. George attended Bolton Church Institute from 12th September 1899 He later attended Mr Jeffreys’ small private boarding school in Folkestone, Kent. He appears on the 1911 Census as an assistant bleacher, probably in his father’s firm, living with most of the family, a housekeeper and five servants at Breightmet Hall, Bolton. The Glaisters were one of Bolton's most prosperous and prominent families. George's grandfather, Thomas Glaister, his brother - also Thomas Glaister - and his brother in law, William Wharton Tong, all served as Mayor of Bolton, as did several more distant relatives. George enlisted in autumn 1914 as a Private in the 1st/5th Battalion, The Loyal North Lancashire Regiment, which recruited many men from Bolton and which was part of the 55th (West Lancashire) Division. He arrived in France on 12 February 1915. He received a commission as a 2nd Lieutenant. He was wounded in the ankle by shrapnel on 25 April 1915 and was invalided back to England to spend time in hospital at Dover. He returned to France and during the Battle of the Somme in 1916 he was promoted to be temporary Captain before being wounded again. He was killed in action in Belgium, aged 26, on 31 July 1917, probably on the first day of the The Battle of Pilkem Ridge (31 July - 2 August), part of the Third Battle of Ypres. His younger brother, Stephen Glaister, was killed in France on 9 April 1917 while serving as a Private with the Royal Fusliers. 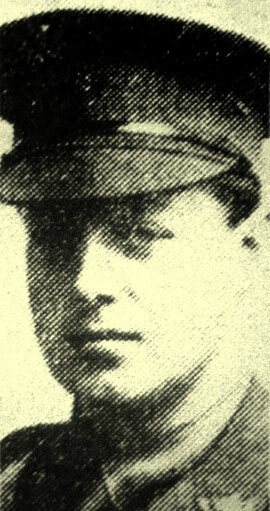 Lieutenant GEORGE GLAISTER is the fourth son of the late Mr. Alfred Glaister, of Brieghtmet Hall, and is the second son to fall, his brother, Pte. Stephen Glaister, of the same regiment, being killed in April last. Lieut. Glaister enlisted soon after the outbreak of war in the L.N.L. Regiment, and went to the front as a private in February, 1915. Soon after arrival he was commissioned, remaining with the battalion, and was wounded in the ankle in April 1915. He returned to the front a year ago. Aged 26, Lieutenant Glaister was an old boy of the Bolton Grammar School, and was a director of the firm of Messrs. Blair and Sumner, Mill Hill Bleachworks, Bolton. Prior to the war he was a keen lover of football, playing regularly with the Worsley Club, and he was a member of the Lancashire Wanderers team on the Holland tour some years ago.